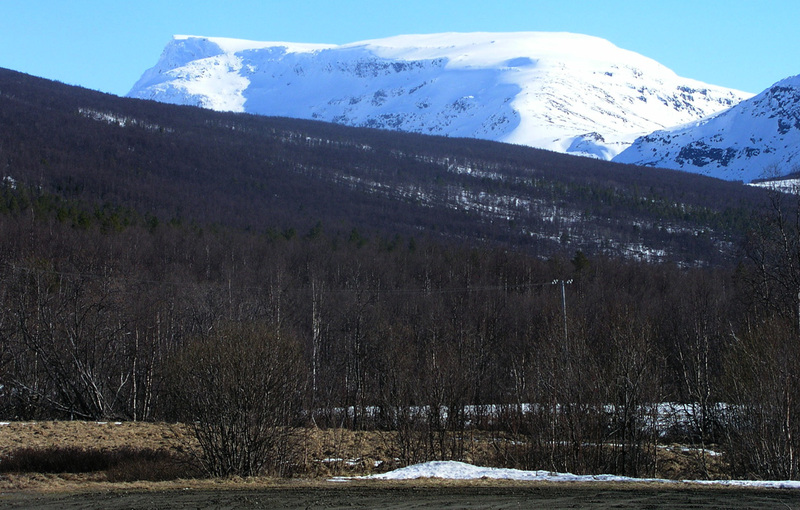 How to get there: This peak is located south of Setermoen. From Tromsø, first drive to Setermoen. Head south on Hwy. E8, then E6 for 161 kilometer in order to reach Setermoen. From Setermoen, continue 21 kilometer south on Hwy. E6 to Skogstad. Leave E6 here and turn left following signs for Bones. Drive about 10 kilometer, then locate the farm Håkstad on your left side. Ask the local farmer, a very friendly man, for permission to park. This is the trailhead, location north 68:39.599, east 018:12.386, elevation 243 meter. The nearest place to stay is likely the Gratangen Hotel, it was closed in May 2005. The hotel at Setermoen was quite expensive and not service oriented, so we started out from Ann Sofie at the Bardufoss Hotel, phone (+47)77830500. Thanks to the early breakfast service starting at 0600, we still started up the hill well before 0900. Route description: From the farm, start out north near the creek Mobekken. The climb is long, but the terrain is quite reasonable. Higher up, one can switch-back on the slope gaining a somewhat more level shelf around 700 meter. Now continue east and climb Håkstadfjellet at about 1000 meter elevation. 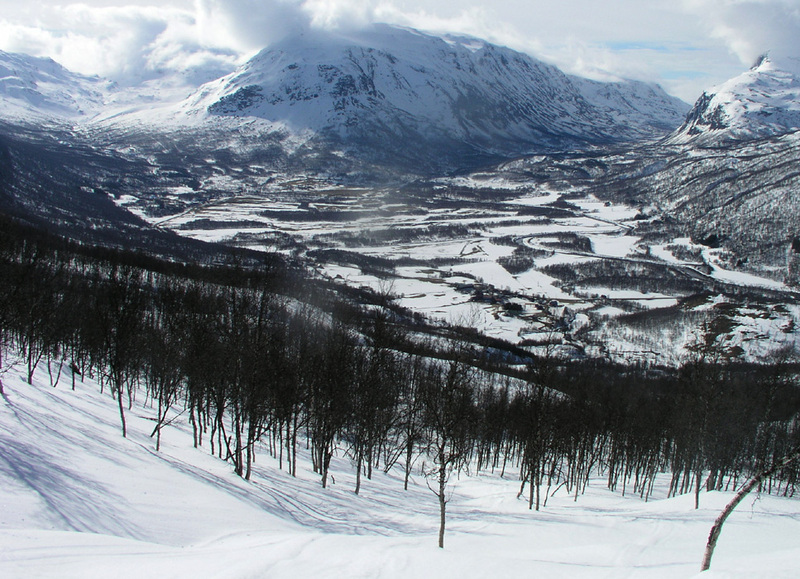 Head south-west until a gentle downhill takes you into the area between Håkstadfjellet and Snøhetta. This area is interesting, when we were there, enormous snow drifts created an interesting landscape. 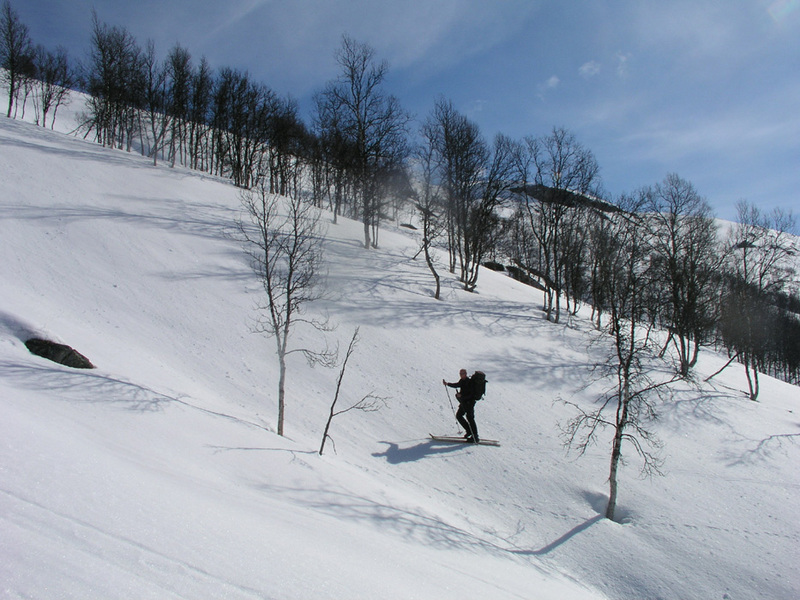 Further along, traverse up the slope leading towards the west ridge of Snøhetta. Follow the ridge upwards. As it gets somewhat steeper one may continue on the right side, then cut back onto the main ridge a bit higher up. 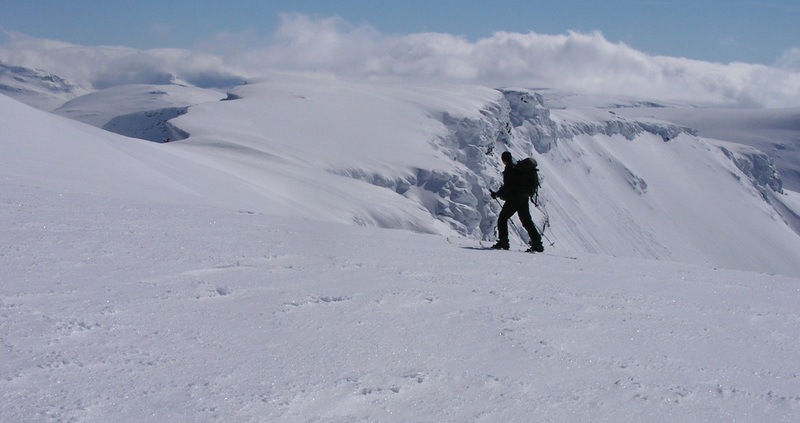 Gradually, the slope becomes more gentle as the route approaches the first (false) summit. Continue almost one more kilometer to find the summit cairn. Make sure to visit the area east of the summit with impressive cliffs and views Make sure to visit the area east of the summit with impressive cliffs and views of the valley Melhusdalen as well as Sørdalen. Be cautious of the cornices. The summit view is very good. Comments: I did this climb with my friend Ståle Grimen. We started out at 0845, and made the summit at 1230 after an excellent skitrip. We spent a full hour on the summit exploring the interesting landscape to the west and south of the cairn. The ski descent took only 1:15, bringing us back to the farm at 14:45. We had an interesting chat with the farmer Håkstad about everything from global warming ("it was never very cold in the winter any more") to stories about hunting and wildlife in the area. An excellent day with good skiing. This was peak number 7 in my T5 trip. Next peak Lille Russetind. 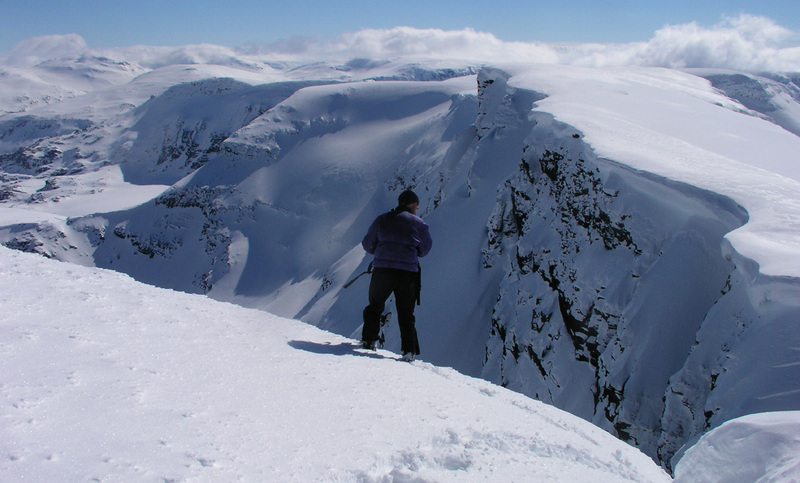 Previous peak Leirtinden. Snøhetta as seen from the lower Salangsdalen valley. The trailhead. This is at the Håkstad farm, the initial route heads more or less directly up towards the two small summits that can be seen. Valley view. 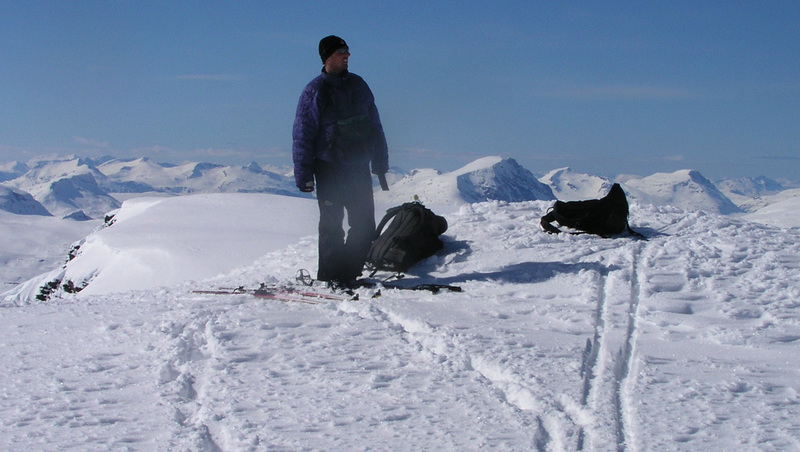 Salangsdalen with Budalen (left fork) and Stordalen (right fork). Ståle skiing steeplu uphill among trees. Snøhetta comes into view whem reaching the top of Håkstadfjellet. Ståle high on Snøhetta in front of an impressive snow ridge. Ståle on the Snøhetta summit. Summit panorama I, the view is south to west. Summit panorama II, the view is west to north. Summit panorama III, view continued east. Impressive cliffs on the east side.